I don't have time to write this up properly, but I couldn't let this pass without comment, so have quickly thrown this page together. I have so far abstained from commenting on Welborne. As a historian I will always prefer the past to the future, and my body will always reject the idea of a town being built on what I might arrogantly consider my countryside. However, it's pretty pathetic to object to a proposal purely because you don't like change. If you have a real, substantive reason, and not a silly vague one like traffic or flooding which NIMBYs always go for when they don't want to look selfish, then you should absolutely air that view. Fareham has always been growing, and not just with Whiteley. Thousands of houses were built in the Highlands and Portchester in one go. Most of Locks Heath was built in one go. Secretly we'd all like the town to be frozen in the past but who gets to dictate the time period and who has to demolish all the houses which have been built since then? Fareham has never been about standing still, it has never been frozen (except in the winter of 2010, that is). That's what I think. It's totally hypocritical, but the perk of owning your own website is that you can pipe up when you see something that's not right. That's what I'm doing this evening. Daily Echo Article: Revealed: The £40m scheme that will transform the M27. Firstly, there are some inaccuracies in the article: the current Roche Court/junction 10 is one of the least congested major roads in Hampshire, not the most. The new junction is surely not within existing highway land as suggested. The proposed layout is not a "full cloverleaf", it is the complete opposite. The map is also misleading. I'm getting those out the way in case I go on to comment on something which also turns out to be untrue. Having dealt with Highways England and local newspaper reporters before, I am willing to believe that Highways England have sent out a badly-written press release about how great they are, and the Daily Echo have re-printed all the spin. There's nothing wrong with the current arrangement, other than a short queue at the u-turn by Pook Lane. I appreciate this will change with Welborne. Going from the M27 to Wickham used to take four seconds, now it's going to involve four roundabouts and countless traffic lights. I strongly suspect this is deliberate to put people off it (less 'carrot', more 'stick'). In a week where we've been taking about Hampshire's air pollution problems, sending lorries on their way to North Hampshire around four new Welborne roundabouts is a strange choice. The whole point of the road layout here is that if you're going from Gosport to Wickham, it is quicker to use the motorway than to use Wickham Road. This keeps Wickham Road quiet. Now there's going to be an extra four roundabouts, the Wickham Road route becomes better again. This is at odds with Hampshire County Council's other project to make Wickham Road (the part by St Christopher's Hospital) better to live near. That teardrop/roundabout at the bottom is an open invitation for somebody to buy Fareham Common and build a supermarket or a drive thru on it. Mark my words, it is too convenient. It even has a footpath make an expensive detour to meet it. The problem with the M27 is that it has too many exits too close together. Lane changes cause delays and accidents; ideally exits should be at least three miles apart. Westbound, the new Roche Court Interchange (M27 J10) is going to be one mile from the current Park Gate exit (M27 J9), reduced from the current two miles. Why are lessons never learned? Curiously, on the eastbound side, there is already a problem with the Roche Court (J10) entrance and Wallington exit (J11) being too close together. The proposal completely ignores an opportunity to fix that. One of the biggest failures with Whiteley is that it is too close to the motorway. Motorways are not supposed to be residents' personal driveways, and motorways also make life difficult for anybody who doesn't want to drive everywhere. Looks like Welborne is going to be completely isolated from Fareham and some people are going to live practically on the slip road. Having said that, now I've seen the full plans, I will concede that I like the bus link to North Hill. That's all I like. The land identified for this junction is clearly visible from both Kiln Road and the houses on it. Kiln Road is mostly privately-owned housing so residents are going to be inclined to object (and they will). Those roundabouts invite all sorts of traffic conflicts. They are going to need traffic lights to function, and even then, will become congested very soon. The Meadow Roundabout in particular will not last like that long. The M27 here is built on an embankment over an area with a history of flooding. The amount of digging involved is going to be expensive, unsightly and unpopular. That roundabout in the very centre ("Garden and Community Roundabout") serves absolutely no purpose at all. Including it shows that either: a) the person doing the design wasn't paying attention and can't see it would cause no harm to make right-turners go to the next roundabout, or b) it has been deliberately put in to increase the sale value of the land and/or to be a nuisance. The map implies Wickham Road is going to have just as little capacity as before, and the text says the bare minimum improvements are going to be made on the motorway. Delays due to low capacity are set to continue. Housing developers are going to pay millions - honestly - for the land which the old/current slip road is built on. It is perfect for a new housing estate on North Hill. If I was a cynic, I'd say this is the driving force behind the idea. In theory I actually really like the layout around the top-left roundabout ("Landscape and Garden Roundabout"). Unfortunately, I can guarantee motorists will not be able to use it safely. The temptation to cut across two lanes to avoid a give way line will be too strong. That merge is also an old-fashioned design: I like it, but the exact same layout was removed from Wickham Road because it was supposedly dangerous. 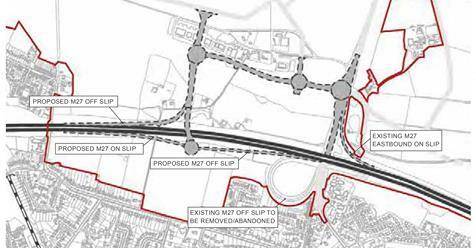 The final plans show the M27 merge marked incorrectly. This is a very simple mistake anybody could make, but rookie errors make you wonder how much attention the designers have been paying. I am not a highway designer or a social engineer. I am a nobody who drives a lot. I do know that everybody will have a complaint of some sort about this junction and Welborne whether it is built or not. I also know a bit about how the world works. Developers pay big money to build shops and houses next to busy roads and in return pay pittance for some road improvements which the cash-strapped council can't afford on their own. The problem we have is that, as we've learned at Quay Street (Tesco Fareham) and as we've learned at motorway junctions across the country, people like Tesco and Buckland Homes are good at making cheap buildings but they know nothing about how to build decent roads. And increasingly (after all the good ones got fed up with bashing theirs heads against walls), neither do the professionals.